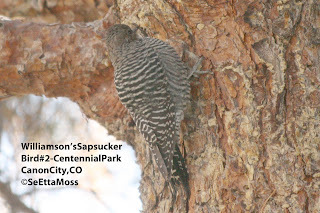 I saw 20 sapsuckers today!!!!! 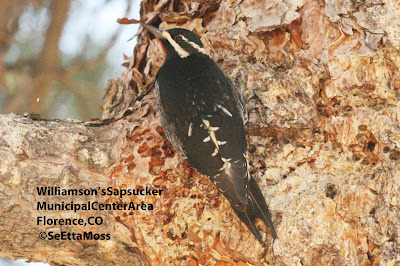 I was astounded to see all of these 18 sapsuckers in or just outside of Canon City,CO--and in only 3 hours of birding!!. 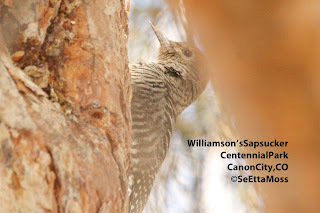 I started off to check on male Williamson's Sapsuckers by first finding two of them at Rouse Park in the same areas where I have seen them previously. 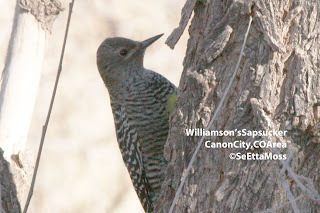 I headed directly to Lakeside Cemetery to see if the 2 male Williamson's I had seen there yesterday were there (if not, then they might be moving between the cemetery and Rouse Park and were not separate individuals from the 2 I saw at Rouse today). 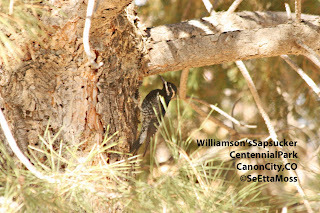 Surprise--not only did I refind the two male Williamson's in the area of Lakeside Cemetery I saw them yesterday but I found 3 more male Williamson's for a grand total of 5 males plus 3 female Williamson's--just at this one cemetery!!!!!! 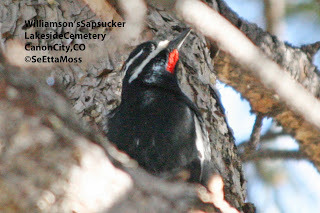 The top pic is one of the male Williamson's I found at Lakeside Cemetery today. 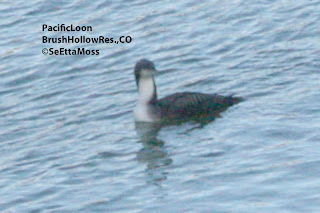 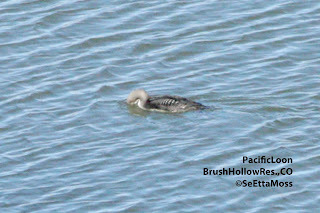 Late this afternoon I found this Pacific Loon at Brush Hollow Reservoir about 10 mile northeast of Canon City,CO. 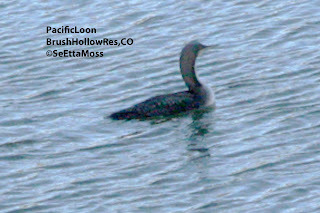 Though Pacific Loons visit large Colorado lakes every fall and winter, it is pretty rare to see this species at this less-than-large lake that covers 200 acres when full--currently about 3/4 full so covering about 150 acres.